I’m a huge fan of shabby chic themed parties. What’s not to love? Pastels, ribbons, doilies and lots of paper pompoms, everything in this party screams dainty to me. This is such a sweet party, thanks to Jaz of Sweet Nest Candy Buffet for sharing this lovely party with us. The ceiling décor looks fab. There’s something about it that makes the whole venue looks airy and relaxing. Fresh flowers, pink and white popcorn boxes and paper pompoms served as their centerpieces. I love the table setting, the doilies together with the polka dots paper mat in pink and blue looks so chic. For added fun, the guests were to predict and vote what they want Kandice to be when she grows up. Wizzo-the magician and Party with Jive, provides fun entertainment for everyone. I super adore Kandice Lovi’s twirly wirly cake! (rotating cake) Lovely of Sugarplum really did an amazing job. Just look at the details! Everything in the dessert spread looks sooo pretty! My favorite would definitely be the cupcakes with golden cage design. It looks so Marie Antoinette-ish. 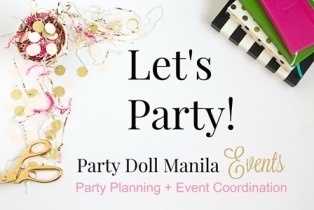 Congratulations Mommy Maja and Daddy Jeff, Kandice Lovi’s shabby chic party was a huge success! I have a shabby chic board on pinterest so its not surprising why I super adore this themed party. Nicely put together, everything just looks so perfect! These are the best party decorations I have ever seen!!! Wow. What a beautiful birthday party! So fit for a pretty young princess But I wouldn’t mind having my party like that! How pretty and elegant at the same time! I’m actually looking for a nice theme for my baby’s birthday next year, this looks like a nice idea. Thanks for sharing!